Between looking for screenshots to educate others from to improving upon our underlying platform time is something we do not have. So excuse the brevity of the discussion. We noticed a fairly reliable pattern be put to the test once again. 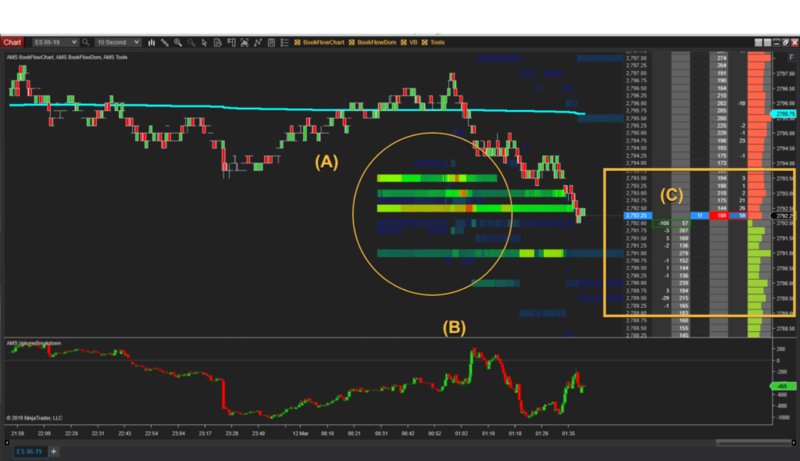 After determining the expected daily range using the MarketProfile tools for the June 2019 ES contract we turned our attention to the DeltaPrint and BookFlow tools to further refine our trade. In the DeltaPrint screen we observed (A) a break below prior support: (B) trending towards an area of Low Volume (LVN) with a target decline large enough to entertain trading; and (C) a general confirmation that the sellers (depicted in pink / red) have taken control. 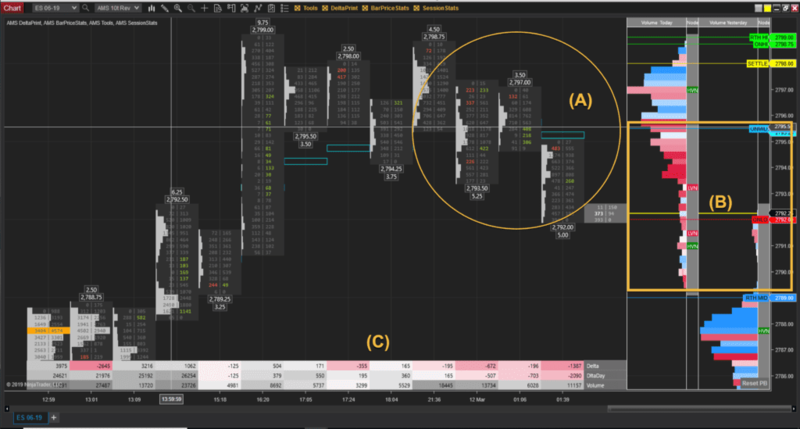 In BookFlow we see (A) a failed attempt to breach resistance; (B) despite a positive uptick in the Delta; and (C) further confirmed by bids being pulled below current trading levels. The identification of patterns derived from their symbols in a manner allowing for testing to take place in a simulated account is a great way to learn how to use the AMS DeltaPrint (c) Suite of tools. Signing up for a AMS Quarterly Membership is as well. We know it takes months to fully adapt and understand how best to use our tools. That’s why AMS developed a hands-on tutorial program to, over a three month period, impart upon you what has taken us years to understand and improve upon. If you are interested email us support@amstradinggroup.com. The only way to fully utilize our tools is if you know how to utilize our tools. We are happy to help.